Have you ever thought of getting into coin magic but were put off by all the hard coin sleights that comes with it? Well, we have now solved that problem. Introducing the Gripper Coins. The Gripper Coins are a special, handmade coin that has a space-age silicone band embedded into the edge of the coin which prevents it from slipping in just about any palming position you decide to use. 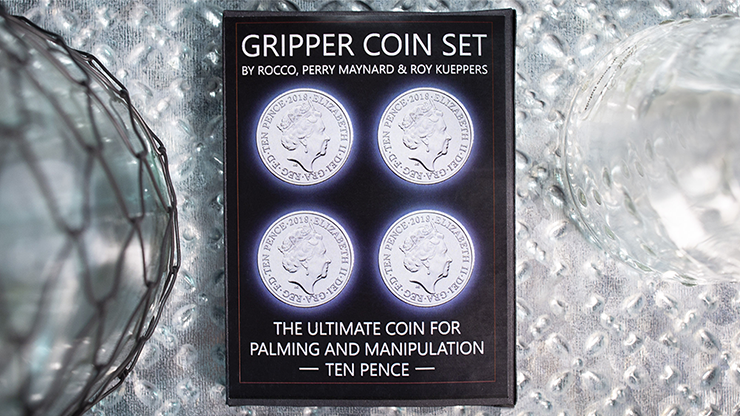 For the beginner coin workers, the Gripper Coins will enhance your learning process immensely when you are practicing your various palming moves. And for the seasoned professionals, the Gripper Coins will give you that sure-locking feel in any of your desired coin palms. The Gripper Coin comes in 4 different denominations, the U.S. quarter, the U.S. half dollar, the Euro 50 cent piece and the British 10 pence. When purchasing any of the above Gripper Coins, you will receive a step-by-step video tutorial from Rocco Silano on how to use the Gripper Coins properly. Rocco will also teach you over a dozen coin moves and routines. But remember, the Gripper Coins are truly limited only by your imagination. Good luck and have fun with the Gripper Coins, my fellow coin workers. Thank you, Perry Maynard. The Gripper Coin comes in 4 different denominations, the U.S. quarter the U.S. half dollar the Euro 50 cent piece and the British 10 pence. You can purchase these denominations in 2 ways. One Gripper Coin at a time or 4 Gripper Coins of the same denomination in our multi-pack. No matter which denomination you pick, you will receive a video tutorial by Rocco Silano that will teach you over 12 coin sleights and routines. If you purchase one Gripper Coin, you will learn several palming techniques and a few routines that you can do with one coin - it doesn't matter what the denomination is. And if you purchase a multi-pack of Gripper Coins of the same denomination, you will receive many more palming techniques and several more four-coin routines. "The Gripper Coins are awesome. I utilize these coins when I'm traveling the world. I'm really excited about these coins." "The Gripper Coins are incredibly easy to grip. They truly are incredible." "The Gripper Coins work amazingly well, and the grip is Fantastic. These coins are a must have." "The Gripper Coins are a terrific new development in coin technology. I see many possibilities with this utility item."